Vietnam’s shift from a centrally planned to a market economy, over the last 30 years, has remarkably transformed the country from one of the poorest in the world into a lower-middle income country. After decades of neglect, the international audience has noticed Vietnam’s achievements and its ongoing global integration and the country is now seen as one of the most dynamic emerging countries in Asia and the World. In 2016, the World Bank already classified Vietnam as a middle-income economy and PwC, on a long-term horizon, expects Vietnam to be the top fastest growing economy until 2050 with an average growth of 5%. The historical and estimated future growth prospects, prudent government reforms, beneficial trade agreements with major trade partners around the world and increasingly internationalized foreign investment laws has led to an influx of both direct and indirect foreign investments. Vietnam, after all, has emerged as production hub for high-tech products, where Intel produces 80% of its personal-computer processing units. Also noteworthy is that 1 out of 10 smartphones are nowadays produced in Vietnam. 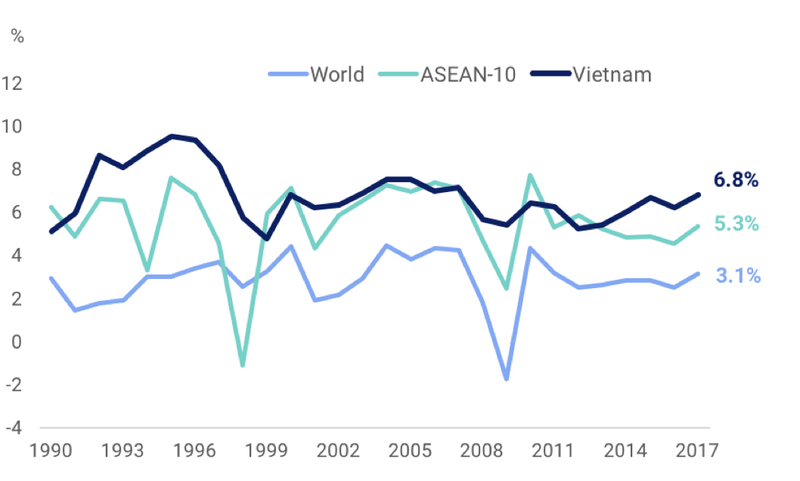 While the world economy is growing at around 3% per year, Vietnam’s steady economic growth of nearly 7% this year will make it one of the fastest-growing markets in the world. Rising domestic demand and booming foreign direct investments are helping the Southeast Asian nation to counter global threats. 30 years ago, in 1986, Vietnam’s government, led by the communist party, decided to leave its centrally-planned and closed-to-the-outside-world economy to become a more market-driven economy, namely: to encourage the private sector, to open Vietnam for trade and to welcome foreign investments. After the country’s reorientation, which was named as ‘Doi Moi’, Vietnam has enjoyed exponential growth. 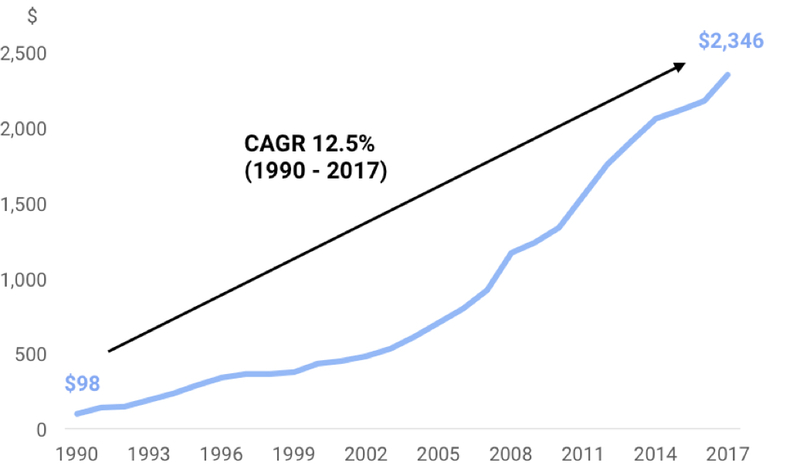 GDP per capita went up from merely $98 in 1990 to an estimated $2,346 in 2017 (CAGR of 12.5%). GDP growth has mainly been fueled by a strong domestic consumption and a boost in exports. Today, Vietnam is a major exporter of soft commodities such as rice, coffee, cashew nuts and rubber, of basic goods such as textile and garments as well as of high-tech products such as mobile phones. At the current junction, solid foundations (household wealth and good basic infrastructure) are laid out for the future growth drivers: domestic consumption of both goods and services, fueled by the rapidly rising middle class, and the country’s increasing importance as the world’s new manufacturing hub. Vietnam, with 95mn people, is the 15th most populated country in the world. With an annual population growth of 1%, it is well in line with the annual growth of India’s population and growing at a multiple of Thailand’s 0.2%. The society is relatively young with an average age of 30 year compared to the European Union with 42 years. 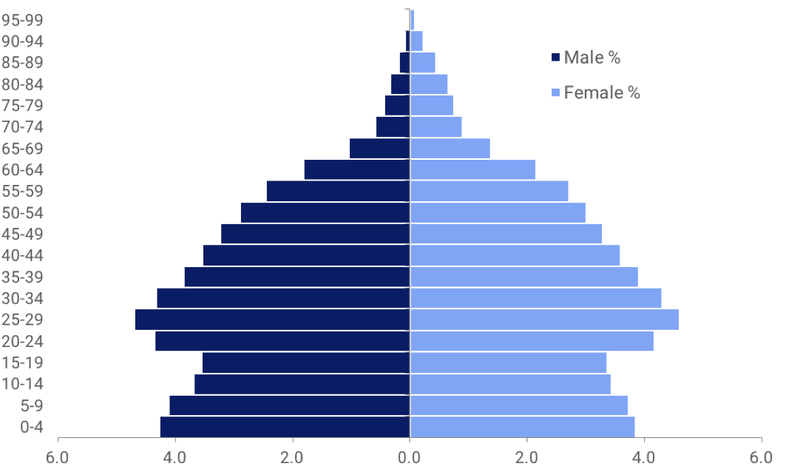 42% of Vietnamese are below 25 years old. The economy will clearly benefit from its youthful and fast growing working-age population, boosting domestic demand and output.